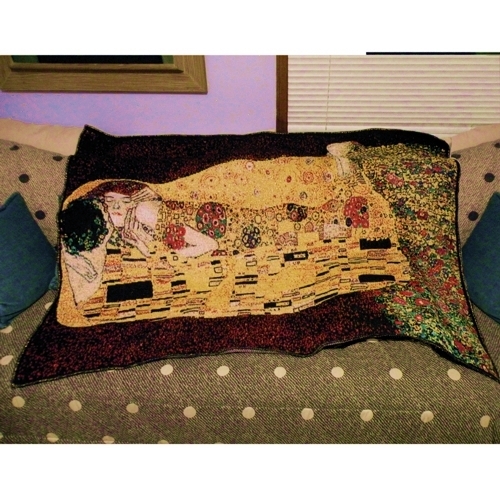 This throw replicates the world famous painting ''The Kiss'' by Gustav Klimt. It shows a couple embracing. While we see their faces, most of their bodies hide behind gold metallic robes. Gold is sprinkled throughout the background, too, creating a glimmering fog around the pair – as if, in this moment, they were the only things left in this world. Size: 40 x 60 inches What about ''The Kiss'' makes it so special?The use of brilliant, gold shimmering threads highlighting the couple in their embrace.